I really enjoy decorating for Spring & Easter. I've had my Spring & Easter decor out probably a little earlier than I should have this year. Ok, strike that, probably alot earlier than I should have. This is what I came up with for the top of my vintage blue dresser. 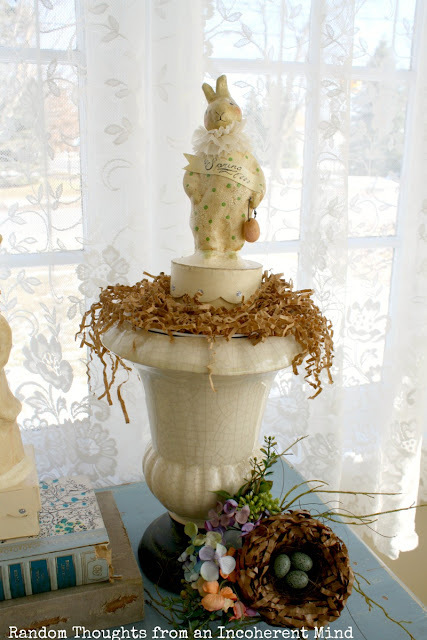 A Nicol Sayre bunny atop a large urn.﻿ I rested a little nest against the bottom. I added this Vicki Smyers chick in an egg house, along with a pail of eggs and my tall bird clock. My kids tell me that chick is scary. He may be a little scary, but in a cute way. I really appreciate your stopping by today. The weather here has been unbelievable gorgeous and I hope it has been for you as well! Everything is so cute but I love that peek-a-boo chick in the egg! It is really cute.......it is on my list today to put out the chicks and the bunnies.....and it is sooooo warm outside today. Really adorable! I'm in love with that blue dresser! Squeal!! Hopping up and down. LOVE all the vintagey goodness. We have such the same taste in the paper mache, glittery stuff. I love it all. Top to bottom, side to side. I wanna sit and stare at it. The chick in the egg is fabulous!! Cute, Cute, CUTE! Mmm. Yum. Love. Adore. 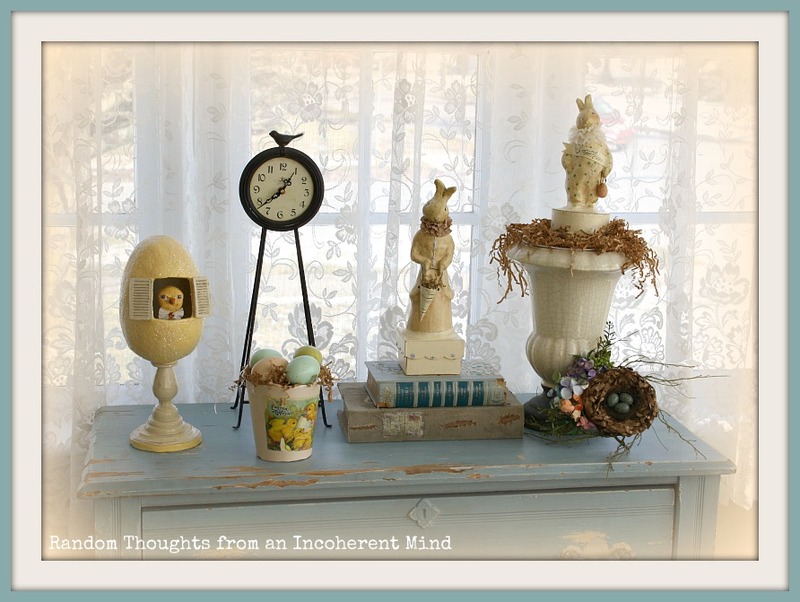 Love your Easter vignette! I definitely need to get out my Easter stuff! Glad you are having nice weather! I love the bunnies ! I don't do much Easter decorating , but your's sure looks cute ! I guess I better get busy and come up with something to blog about . First of all I love the blue dresser. 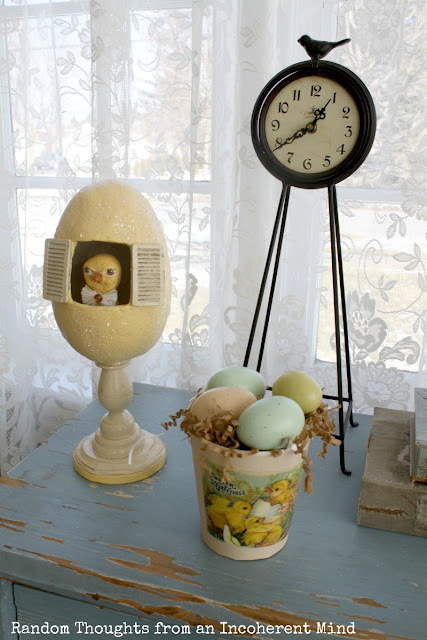 Your Easter decorations are fun, I love vintage bunnies and chicks and you have that knack for putting things together. So cute Gina! I love the chest that dresser too! Gina I must have one of those bunnies. They are too cute. Yes it's a beautiful day here as well. Very beautiful! 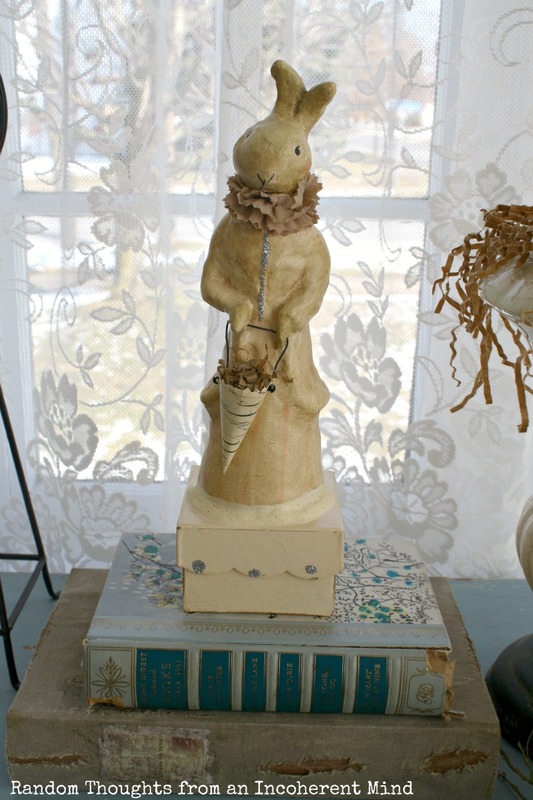 Love how you placed the bunnies on a vintage blue RD book! Love it! Gina...this really is such a cute vignette. Your bunnies are just precious! I love the ones that look like they just came out of a storybook! And the chick is a bit scary, but adorable, too! Gina your display is so nice. I'm hunting for some Easter bits and pieces to put one together. Can't find much at the moment,other than chocolate. I really want a nest with eggs. Oh my goodness, they are just too cute! It looks fantastic. I went hunting for my easter decorations yesterday ~ can't find them anywhere. : ) Yikes. So cute! Spring and Easter is a happy time to decorate, and I love your bunnies. I adore your display of Easter decorations. Just so darn cute! Gina, such a cute job you have done decorating for Easter. Love each piece in your collection. Also really like your chest. Thanks for stopping by. Gina, this is precious! I have loved all of your Easter decorations! You've inspired me to get busy! Spring is certainly springing at your home..and Easter is on it's way. No doubt about it. Very cute! I love it Gina! That blue chest is drop dead gorgeous! I absolutely love the bunnies, and scary chick is frightfully cute! I have that same clock and I love it! Great spring weather here too! Love your blue dresser Gina, and everything on top of it is so pretty! Yes, the chick is a little scarey but I agree in a good way! I love your Easter displays, your rabbits are adorable!! I am hosting Easter dinner and don't have a darn thing up yet! Beautiful and your chest is just the most beautiful color. Did you do it yourself? I need to work on decorating around the house! How pretty, Gina! I adore the vintage flair. I think many folks decorated for Spring early...we never had a day of winter where I live. As soon as New Year's passed, spring was on! It all looks terrific to me. I started on some spring vignettes, and they are ALL kind of lame and unfinished still. Thanks for the inspiration! 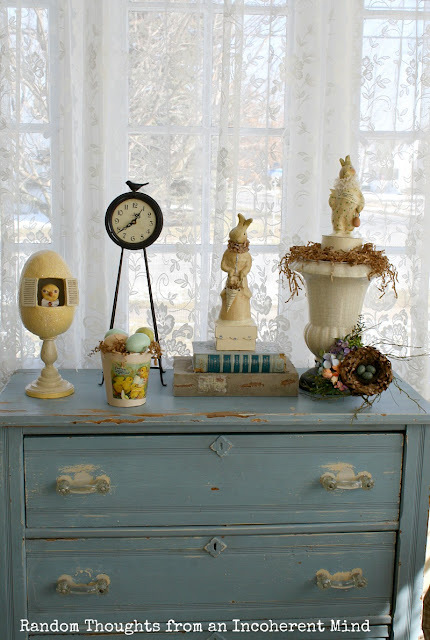 Love the Easter vignette! So spring like! Yes - it is so beautiful here in SC too! Enjoy your day! It looks so pretty Gina, love those Nicole Sayre figures. The chick is cute in a funny way lol. Everything looks so sweet for Easter love your Bunnies. you did a Beautiful job putting this all together.Thanks so much for your sweet comments on my Easter Tablescape. Hope you and your family have a great week. That chick does look a little intimidating :) Absolutely beautiful and inspirational. Beautiful vignettes Gina. Spring has sure sprung in your house. Totally sweet Gina. I love all your cute bunnies...and chick. A very Happy First Day of Spring to you my friend. So cute! I love anything Nicol Sayer and your bunnies are adorable. so loveley!! so easter and so spring! spring is definitely here!! enjoy this beautiful weather!! So super cute. I have to put my Easter decor up this week. Love how you decorated the urn and put the bunny on top, Gina! 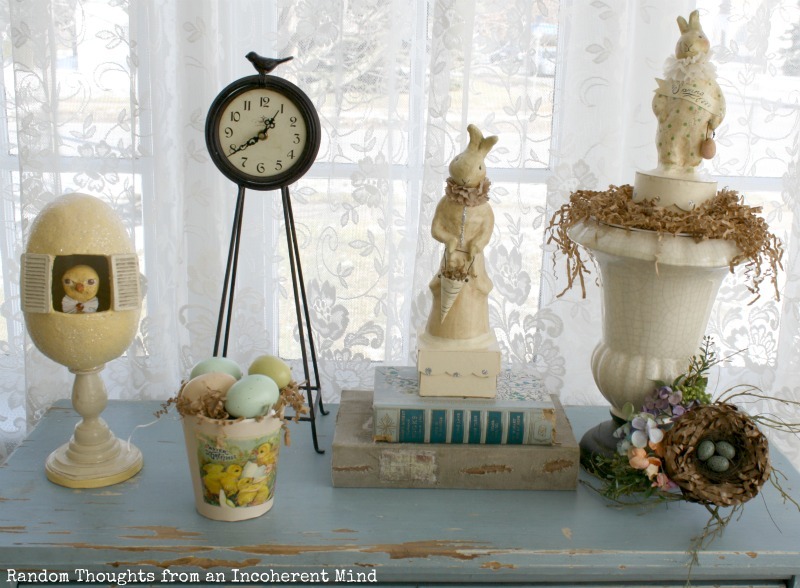 Such a great vignette on your table for Spring and Easter! Our weather has been incredible too. Yesterday and today is was in the low 80's. In March! Very pretty grouping and it's perfect for your dresser. That shade of blue is so soft and fresh. Stunning hardware too. Love that little clock with the bird! Thanks so much for linking Gina, I loved this post! Visiting you today via "Share your Cup Thursday" Your Easter decor is so sweet the bunnies are adorable. The blue dresser is beautiful, love the hardware. This is an adorable tabletop vignette, Gina! I love how you brought several different elements together to create such a sweet Spring/Easter look. Love all your Easter decorations! Love your bunny... He looks sooo cute...!! Time for a Spring Giveaway! Spring'tacular Craft Link Party Parade!